The occurrence of volatile sulfur compounds (VSCs) is influenced by factors including yeast selection and fermentation conditions; the nature and quantity of precursor compounds; the availability or absence of oxygen at different points of the winemaking process; and the availability and speciation of transition metal ions such as copper. As defence against the formation of undesirable VSCs, especially hydrogen sulfide, winemakers typically rely on monitoring must-nitrogen, additions of diammonium phosphate and copper, and choice of closure and its oxygen transfer rate. However, despite these commonly used management practices, post-bottling VSC release and sulfur-related off-flavours, can still be observed in some wines. In previous AWRI research, a number of obvious sulfur-containing precursors (thioacetates, s-methyl methionine, cysteine, DMSO, glutathione, methionine, DMDS and methionol) have been assessed for their role in releasing VSCs, and results indicate that many of these do not play a significant role in post-bottling VSC release. This suggests that other precursors are present which are yet to be identified. Sufficient observational experiments have been established across a range of wines, to show that the accumulation patterns of VSCs are relatively consistent post-bottling, but that they differ significantly between red wine and white wine. It remains to be established whether the accumulation patterns observed are driven only by release from precursors or, more likely, a combination of release and subsequent loss of VSCs by incorporation into other chemical forms (e.g. binding into quinones, or the formation of compounds such as disulfides or polysulfanes). In addition to the de-novo formation of VSCs, their accumulation might also reflect their stability and reactions causing their ‘loss’ in wine. Thus there remains a knowledge gap relating to novel precursors and their degradation mechanisms, which will be addressed by this project. This project will also characterise the role of yeast in forming precursors for VSCs, and the biochemical pathways that affect VSC formation. The yeast biochemical pathways associated with release of hydrogen sulfide from cysteine have been established. However, recent work indicates that sulfate, for example, is a key sulfur source incorporated into ethanethiol, ethylthioacetate and diethyl disulfide, but, interestingly, not into methanethiol, methyl thioacetate or DMS. Research by international teams has also indicated that some vineyard interventions such as foliar spraying, have an impact on VSC formation, as does the addition of compounds like glutathione to must. Hence different classes of VSC are likely being derived from different pathways at different points of production, and therefore understanding VSC accumulation from fermentation through to bottle-aged wine, requires a multidisciplinary approach. • the chemical and environmental factors which lead to otherwise innocuous sulfur-based compounds being converted to those that have a significant sensorial impact in wine. Diorgano-polysulfanes are a class of putative precursors to hydrogen sulfide (H2S) that may be produced during fermentation when thiols are oxidised in the presence of copper. They have the potential to act as latent sources of H2S in finished wine. The stability of dicysteinyl-polysulfanes was investigated in model wine, as well as factors influencing the liberation of H2S from these compounds. The stability of the polysulfanes was dependent both on the length of the sulfur-linking atoms (Sn) and on the presence of a reducing agent, such as SO2 or ascorbic acid (Figure 16). Dicysteinyl-polysulfanes containing up to three sulfur-linking atoms were the most stable, with 84% of these polysulfanes remaining in solution after six months, compared to polysulfanes containing four or more sulfur-linking atoms that decomposed rapidly with only 26% remaining after six months. 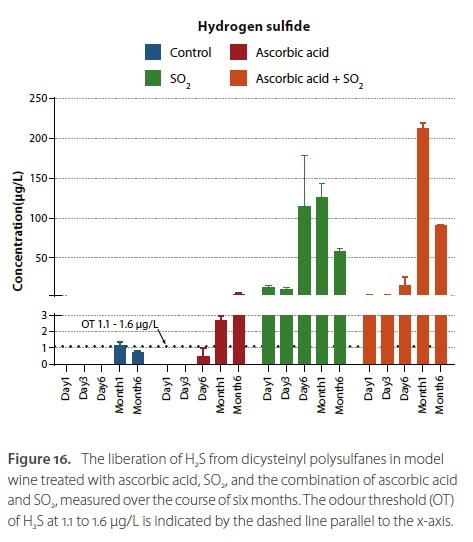 Importantly, SO2 was associated with the rapid degradation of polysulfanes and subsequent liberation of H2S. The sulfur-containing amino acid methionine has been identified as a possible precursor of the undesirable VSCs methanethiol (MeSH) and methylthioacetate (MeSAc) in laboratory-scale fermentations. High concentrations of methionine in a synthetic grape juice resulted in increased formation of both MeSH and MeSAc at the end of fermentation. In addition, the formation of these undesirable sulfur compounds depended on the genetic make-up of the yeast used, and four of the genes that might be involved in the release of MeSAc and/or MeSH during fermentation were identified. Commercial yeast manufacturers offer a wide range of yeast strains, but little information is known about their winemaking characteristics, particularly for red ferments. From a 2017 vintage trial of Grenache (50 kg) with six different wine strains, it was confirmed that one of the strains (AWRI 1776) produced high concentrations of MeSAc and MeSH. Formal sensory evaluation showed that wines with high concentrations of these undesirable sulfur compounds were rated highly in ‘drain’ (reductive) and ‘tinned vegetable’ aroma attributes. AWRI 1776 will be used to study in more detail the formation of MeSAc and MeSH under different winemaking conditions. In the same Grenache wines, it was also confirmed that the choice of yeast strain has a great influence on the release of the fruity thiol 3-MH, with one of the yeast strains assessed (AWRI 2914) producing twice as much 3-MH as the other strains. Future work will assess whether this increased formation of 3-MH has any effect on the sensory characteristics of these red wines. to ‘reductive’ aromas in wines post-bottling?